Style wise, Logan Browning has been on her A-game. The actress attended the 50th NAACP Image Awards at the Dolby Theatre yesterday evening(March 30th) in Hollywood, California. Brown is a difficult color to pull off but I think in this instance, that is not the case. 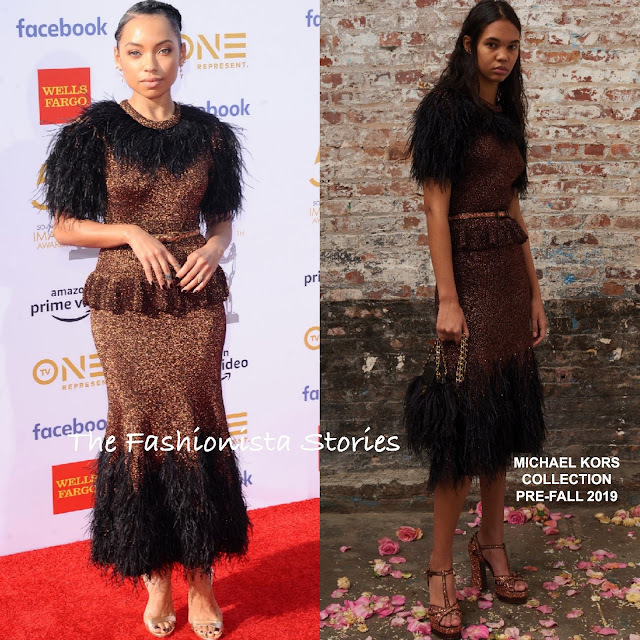 Logan was a sophisticated beauty wearing a MICHAEL KORS COLLECTION PRE-FALL 2019 brown & black feather embellished, peplum dress, which was belted at the waist. Her beauty look was flawless as always, which topped off her look along with a gold statement jewelry and CASADEI ankle strap sandals.